When to marry? The wedding day was considered to be the most important day in the life of a Victorian girl. The girls were taught from the early age to marry and to take care of the family. The marriage of a girl was something very special for the mother, the soon to be bride and her family. 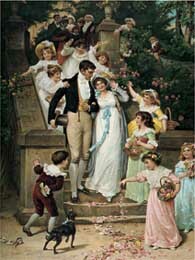 The wedding and its related events were rooted in very old traditions that were still followed during the Victorian era. Among many things influencing a young girl were, the month and the day on which she would get married. June was the popular month for marriage as it resembles the Roman goddess, Juno. It was believed that the goddess would bring prosperity and joy to the couples marrying in June. One of the other reasons to marry in the month of June was that the bride was more likely to give birth to her first child in spring. This was an important factor to consider since that would give her plenty of time to relax before the fall harvest. The Victorian brides were superstitious about the wedding day. What dress to wear for marriage? In the 16th and 17th century, the teenage brides wore pale green dresses which were a sign of fertility. If the bride was in her twenties, she would wear a brown dress, while older women wore black. Since Queen Victoria’s marriage, white was the traditional color. The early Victorian dress had a fitted bodice, small waist and full skirt made of organdy, gauze, tulle, lace, silk, linen or cashmere. The veil was a fine gauze, linen or sheer cotton. Veils were attached to a tiara of flowers which were generally orange blossoms for the bride. The brides along with the dress also wore accessories like short white kid gloves, hanky with maiden name initials, embroidered silk stockings, flat shoes ornate with bows and ribbons at the instep. During the mid years of the Victorian era, middle-class wealth increased, which led to the new riches. 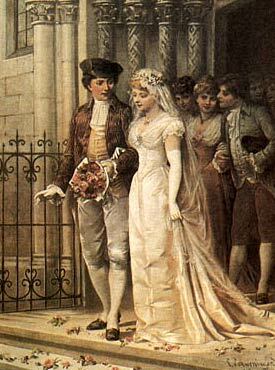 The wedding gowns started to be seen as a status symbol. In the later years, demi-train large sleeves were in vogue. In case the marriage was in the church, the bridal dress must have a train, with a veil of the same length. The veil could be lace or silk tulle. From the mid years till the 1890s, the veil used to cover the face of the bride only to be lifted after church. The remarrying widows in the early and mid-Victorian era wore a pearl, lavender or satin gown trimmed with ostrich feathers. One difference was that she had no bridesmaid, no veil, and no orange blossoms. Jewellery used to be an important element in the weddings. Diamonds have always been favorite jewellery for wedding ceremonies. When the white dress was in fashion, pearl and diamond combinations were generally used. The mid- Victorians wore a diamond diadem for the ceremony to flaunt their wealth. This jewellery was traditionally a gift given to a wife from her husband. The dressing of the grooms: The grooms were also fashion conscious on their wedding day. In the early years, the groom wore a frock coat of blue, mulberry or claret and a flower favor in his collar. By 1865, the coats had a special flower-hole. The groom’s waistcoat would be white and trousers of lavender doeskin. By mid years of the era, frock coats were rarely worn. By 1886, men had started wearing pearl colored gloves having black embroidery. A black colored top hat was an obligation throughout the Victorian years. By the end of the Victorian era, the weddings were allowed to be in the evening as it is today. The father of the bride dressed like the groom and the groomsmen and according to the time of the day for the marriage ceremony. Bridesmaid’s dressing: Bridesmaid gowns had to be beautiful as they became a part of the bride’s attire after the wedding. The bridesmaids used to cover their heads with short white veils falling from a tiara to just below the hip. If the wedding was at home, then no veil was required. By the mid years of the era, white was out of fashion but was worn in amalgamation with other colors. By 1898, the bridesmaid had to wear a dress in contrast to the bride’s dress, and this is still practiced. Children’s costumes in weddings: Children formed an integral part of the weddings. Little girls would be ring bearers and if older, would play the role of junior bridesmaid. The girl’s dresses were white muslin which were tied with a ribbon sash matching their stockings and shoes. Boys would dress in velvet jackets, short trousers and round linen collars which were fastened by large bows of white crepe de chine. The suits would either be black, green, blue or red with a perfectly matching hat. There were social customs which stated what should be worn by the female guests and the mothers. If the wedding took place during daytime, guests wore walking or visiting costumes and the mothers and other females in the family wore reception toilettes. It was necessary for all the women to wear bonnets in church, but it not compulsory if the wedding was at home. Black was considered to be a perfect color for the mother of the bride in the later years.